Scientific Department, Argentina Acupuncture Society, Berazategui, Argentina. Copyright © 2014 Adrián Angel Inchauspe. This is an open access article distributed under the Creative Commons Attribution License, which permits unrestricted use, distribution, and reproduction in any medium, provided the original work is properly cited. In accordance of the Creative Commons Attribution License all Copyrights © 2014 are reserved for SCIRP and the owner of the intellectual property Adrián Angel Inchauspe. All Copyright © 2014 are guarded by law and by SCIRP as a guardian. In an analytic methodological approach, TCM Shao Yin circuit and Lightning physics are compared in order to provide an academic support to relate these phenomena. The aim of this work is to offer a scientific description contrasting both events, so to find an electrophysiological explanation for the complementary resuscitation maneuver over K-1 Yongquan acupuncture point. The first publication about K-1 Acupuncture Point as an alternative to CPR failure was in Resuscitation Journal  —April 2010. By August 2013, World Journal of Critical Care Medicine of Beijing  published, as Editorial Committee cover, the integration of Complementary resuscitation maneuver on Yongquan at different stages of the ILCOR sequence—CPR. The University of Jerusalem—by Dr. Reuven Barak— has also applied to starting the Hebrew translation of that resuscitation protocol. More than a quarter century after K-1 first application, Occident has shown a growing interest on its merits [3,4]. Ancient Chinese considered Kidneys as repositories of Life Energy. Thus it could be read: “Shen is the repository of the Ancestral Power” “··· and save the Essence of Life”  or therein lies the Pure Energy” . Described as “Survival Axis” , Shao Yin energy plane—formed by Heart and Kidneys —requires functional harmony that enables survival even to lifethreatening situations. This “opposing play” between Water and Fire [10,11] is a sample of Yin/Yang embodiment within ourselves: “The Heart is the Yang in the Yang ··· and Kidneys are Yin within Yin” . Thus, Chinese enunciated the first point of the Kidney channel as an “alternative physiological pacemaker” involved in this complementary resuscitation maneuver (“Yongquan is the root of Shao Yin” ). No questions have been raised about the recognition of Yongquan potential to restore cardiac automatism interruption [1,2]. Today there are international publications that detail K-1 action over the hypothalamic-pituitary—suprarenal and cardiac axis [3,9,13]. Characteristics of these two electrostatic energy circuits will be analyzed. Lighting and Shao Yin can share similar origin; are powered by the same energy sources— Heaven and Earth—thus being able to explain its developments and consequences [5,6,10]. In an attempt to shed light over holistic principles underlying Traditional Chinese Medicine (TCM), this type of “Lazarus Effect”  compared with electrophysiology and physiopathology of this phenomenon produced by an electrostatic discharge that occurs between Heaven and Earth in a natural way . We will compare these statements set for the Chinese classics with meteorological events involving interaction between Heaven and Earth—lightning is a clear example —looking for new explanations arising from K-1 applications [5,6,13] Physical-Mathematical Analysis of Lightning. It is a typical natural phenomenon that takes place between Heaven and Earth during a thunderstorm . It is a transient, extremely high, intensity electrostatic discharge (up to 30,000,000 volts) that occurs between clouds and the ground. It happens for a potential difference between the Earth energy (negative) and its opposite polarity: the Celestial energy (positive) . Also in Acupuncture, meridians go throughout the body following a direction which vector is established by the very energetic polarity of each journey. 1) High intensity of electrostatic power2) Sound (thunder)3) Light (lightning). Referring to the last option—the “visible part” of lightning—is something that seems to “fall” from the cloud, though in many cases it does just the opposite way. Source: From “Descripción Física del Rayo” . It is necessary to clarify the widespread but incorrect idea that lightning “fall” from heaven [5,6]. When the hot air from the lower layers of the atmosphere affects one cumulonimbus, it reaches the tropopause, and positive charges (+) of the cloud are attracted by negative charges (−) from Earth, giving rise to the phenomenon of lightning. According to the discharge’s polarity, there are four types of lightning between the ground and the clouds. The most common is the between clouds. Specifically, type 4 (see Figure 1) seeks the optimal transmission medium that is generated from Earth to Heaven. Both circuits will be confronted on a Methodology of Comparative Analysis, correlating definitions, calculations and concepts possible to be checked against its functions and results. Classics and Ancient relate the relevance of this interaction respect to organic life support systems: “The Yin (Earth) regulates the organs; Yang regulates the viscera. The Celestial Yin absorbs energy, while Yang absorbs the energy from the Five Organs” . Thus, this phenomenon manifests with identical vector and polarity to that established by the Chinese to the Kidney channel, which beginning is located K-1 Yongquan (see Figure 2). Figure 1. Different types of lightning. 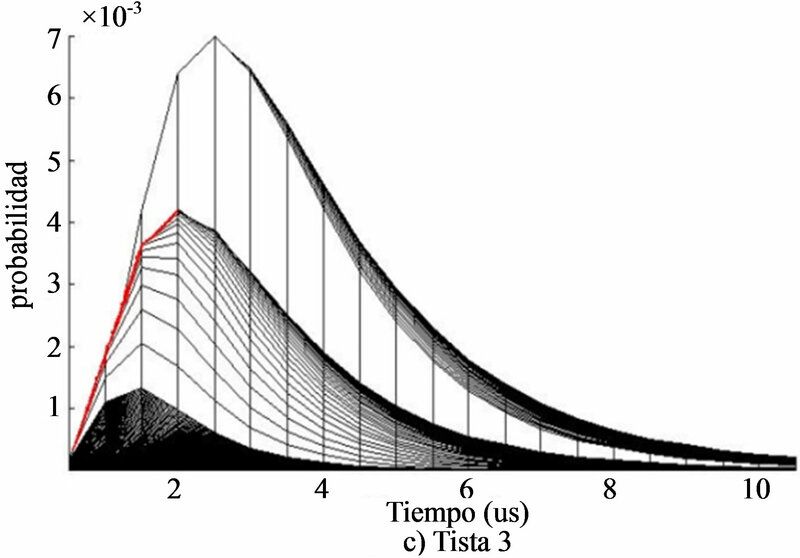 Source: from “Descripción Física del Rayo”  (Figures 2 and 3). Figure 2. Topographic location of Yongquan. Source: author. that connect them, establishing the function of mentioned Shao Yin plane. Produced dielectric breakdown of the air, an ionizing wave propagates towards the cloud initiating the first return stroke to near half the value of the light speed (70 microseconds). If the cloud has additional burden, another channel is set down in the path established by the residual discharge, initiating another shock return to its origin point (see Figure 1). Thus occurs an effect of “roundtrip” referred to the particles, that returning instantly to the cloud, causes the vision of “lightning strike”. This is called “Main Route or Initial Return Discharge” (“Main Route or Lightning Return” of Heinz Kasemir—Figure 3). The Initial Return Discharge is the “open circuit” between Heaven and Earth for a short interval of time. Thus, the negative charges can cross the driver channel to go towards the positive ones seeking to neutralize each other. Consequently, within the channel, negative electrons and positive ions are put into motion. This mass of ions is a thousand times greater than that of the electrons, their mobility is significantly smaller. So by convention, we say that the electric current or Main Lightning Road (see Figure 4), it follows an upward course, established by a path of less resistance to the spread of the electricity, higher from the ground to the cloud than in reverse. This is a similar vector to the established Shao Yin circuit (see Figure 5): Earth’s Yin stimulates Yongquan, and starts with an upward discharge, ascending in search of celestial Yang, calling to action to those organs located in the highest part of the body which vital function cannot be interrupted (Heart-Lungs). When accidentally lightning discharges its voltage on a human, its zone to “grounding” is the same as the location of the K-1. Interestingly, the impact of lightning on human follows the Shao Yin circuits, affecting the cardio-circulatory system to and from the said point. It is valid to topographically correlate this region— starting point of the Kidney channel and “root” of the Shao Yin  origin of the Initial Return Lightning Discharge. It allows calculating the probability of the value of its current peak through diagrams that correlate ‘Intensity’ and ‘Probability’. If Probability is positioned on the abscissa and the Intensity on the ordinate, it results in a reverse curve that represents Shao Yin Recovery (see Figure 5). Changing axis, these functions—that is, placing the intensity on the abscissa axis—the curve shows almost equal rise in its initial energy discharge, showing higher probability at higher stimulus intensity (see Figure 6). Figure 3. Lightning phases’ diagram. Source: from “Descripción Física del Rayo”. Figure 4. Probability of density graphical course. Source: from “descripción física del rayo” . Figure 5. 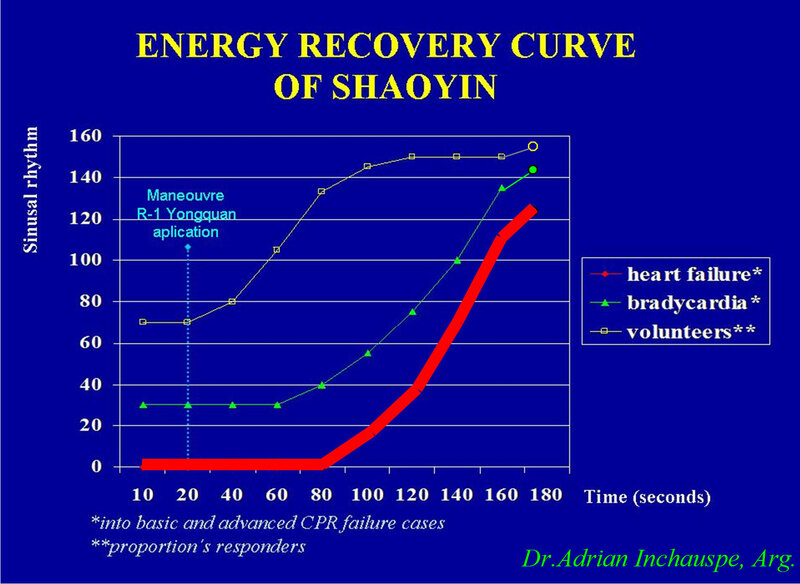 Shao Yin’s energy recovery curve. Source: author. Figure 6. Cumulative function of a lightning discharge. 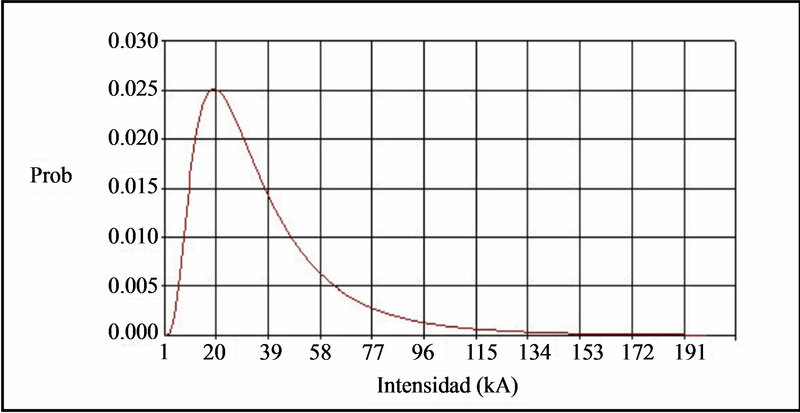 Source: from “descripción física del rayo . “Recovery Curve Shao Yin” (see Figure 5). This similarity further Impress to the analysis of the function of Joint Probability Density for lightning Intensity that interrelates its main properties: intensity, peak current and time of the wave front; expressed mathematically by the formula p (I, tf) (see Figure 7). Figure 7. Probability density for lightning intensity formula. Source: from “descripción física del rayo” . Figure 8. Comparison between accumulated lightning discharge and Shao Yin curves. Source: author. foot for this purpose - is transmitted to the upper trunk or Superior Jiao, that contains vital organs that can not interrupt its continuous function (Heart-Lung). The upward trend of energy and the mobilization of own negative electronic charge of the polarity of Kidney Meridian allowed comparative analysis between the two phenomena mentioned before. The impact of lightning on humans also travels the Shao Yin circuit, primarily affecting cardiovascular function. Interestingly, during the emission of light caused by the ionization of air molecules, found them to be in “plasma state”. Interesting are the Old Classics References on the “energy status” present at the time of syncope. Khi Pa— Yellow Emperor’s personal physician—warns: “In these cases, do not disperse or tone: You must simply direct the energy, since there is neither vacuum nor plenitude” . In electrical neutrality that seeks to compensate the mentioned Initial Return Discharge, Chinese agreed to establish a similar electrical state during cardiac arrest. The zero point of movement’s cessation; but also inaugurates the beginning of it . This makes it easier to understand the restoration of the cardiac cycle through the stimulation from its “lead point”. Like lightning, Initial Return Discharge reopens this circuit, with the possibility that there is residual power in the same channel back to its point of origin. This evidence would support placing needles in Yongquan applied during defibrillation in advanced CPR, thus reinforcing the shock stimulus provided by the electric shock . Finally, the comparison between Accumulated Lightning Discharge diagram and the Recovery Shao Yin curve surprise by their similarity (see Figure 8). Lightning discharge transitoreness is comparable to the result obtained by stimulation of the maneuver, though—if that practice is effective in the human—the curve does not decline, maintaining a plateau as a satisfactory answer. Establishing measurable parameters shared by both phenomena, we may give scientific basis for the principles that metaphorically express the canons of Chinese Medicine. “When the power of Shou Shao Yin (Heart) is exhausted, the arteries do not work, the blood does not flow, the dye loses its shine and becomes dark. The above statement makes implied reference to the assistance of Yongquan—as source point of Water’s organ—to the heart, seeking to restore the lost vitality of its antipode Fire. This analysis took into account the old and new versions of the knowledge to establish comparative parameters between East and West. Like lightning—whose Return Discharge possibly does not go up or down, but results in both simultaneously—both are called knowledge on the interaction of the eternal protagonists of these natural processes occurring between Heaven and Earth. To Mr. Gonzalez Molina, F. and his paper “Descripción Física del Rayo” (Physical Lightning Description”)  referred and recommended bibliography which charts and corresponding formula has been extracted. A. A. Inchauspe, “Traditional Chinese Medicine K-1 Yongquan and Resuscitation: Another Kind of Lazarus Phenomenon,” Resuscitation, Vol. 81, No. 4, 2010, pp. 505-506. A. A. Inchauspe, “Drawing the Yongquan Protocol into the Different Stages of the Cardiopulmonary Resuscitation Sequence,” World Journal of Critical Care Medicine, Vol. 2, No. 3, 2013, pp. 17-20. A. A. Inchauspe, “D-Phenylalanine Injection over K-1 Yongquan: A Theoretical Way of Upgrading Survival Rates in CPR. Chapt. 7: ‘Scientifically Upgrading Key Chinese Traditional Medicines’ Section 7-2: Major Bioactive Herb Fraction Discovery from Acting Mechanism Studies to Safety Evaluation,” BIT’s 8th Annual Congress of International Drug Discovery and Technology (IDDST- 2010), Beijing International Convention Center, 23-26 October 2010. A. A. Inchauspe, “Mi Experiencia en la Resucitación Cardiovascular a Través del punto R-1 Yongquan,” VII Congreso de FILASMA-XVII Curso Internacional de Acupuntura, Farmacopea y Medicina Tradicional China, IV Simposium SAME, Sevilla, 2010. H. Ti, “Su Wen, Part I; Book I; Chapter 34. Ed. Continente,” Buenos Aires, Argentina, 2009. H. Ti, “Su Wen, Part I; Book I; Chapter 9. Ed. Continente,” Buenos Aires, Argentina, 2009. H. Ti, “Ling Shu, Chapter 5. Ed. Continente,” Buenos Aires, Argentina, 2009, p. 42. H. Ti, “Ling Shu, Chapter 10. Ed. Continente,” Buenos Aires, Argentina, 2009, p. 81. H. Ti, “Su Wen, Part I; Book I; Chapter 70. Ed. Continente,” Buenos Aires, Argentina, 2009. H. Ti, “Ling Shu, Chapter 9. Ed. Continente,” Buenos Aires, Argentina, 2009, p. 59. H. Ti, “Ling Shu, Chapter 30. Ed. Continente,” Buenos Aires, Argentina, 2009, pp. 157-158.